NOTE: This is an old faithful that has never lost its popularity. 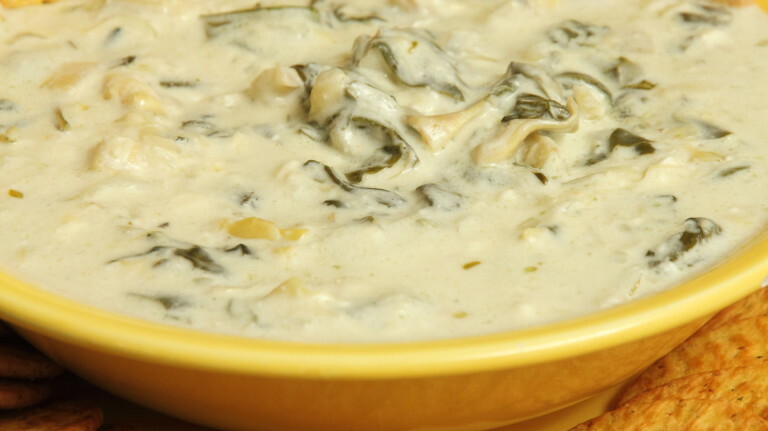 It is still as wonderful as ever, with the satin feel in your mouth and bits of warm spinach and artichoke combined in luscious cheeses. Serve with your favorite toasted breads or crackers. Preheat oven to 400-degrees. Place the butter in large skillet and sauté the onion and garlic for 5 to 6 minutes, until golden in color. Add the spinach, and stir until slightly wilted. Add the artichoke hearts and work into the spinach mixture. Keep heat on low simmer, and add the cream cheese; stir until melted into the mixture, about 2 to 3 minutes. Add the Parmesan cheese and 8- ounces of the Monterey Jack cheese. Continue to stir until the cheeses are melted in and the mixture becomes slightly bubbly, 2 to 3 minutes. Add the milk and red pepper flakes; stir until smooth. Remove from heat and place the dip in an oven-proof serving dish and sprinkle remainder feta and the 2-ounces of the shredded Monterey-Jack over the top. Place in oven for 4 to 5 minutes, or until cheeses become golden and melted on top. Remove from oven and serve with toasted pita wedges. Makes 4 cups.